In 2009 when Makerbot was just coming out people thought Bre Pettis was crazy. “No one is going to print plastic stuff at home”. There was a certain novelty to the toys the company printed at TechCrunch Disrupt New York that spring, but visionaries clearly saw the future. In the ensuing four years the 3D printing industry has exploded. When Pettis and his company Makerbot came on the scene 3D printers were machines that cost tens of thousands of dollars and were made for “shops”. Auto parts manufacturers, architects and other manufacturing companies used 3D printing, but no small business was going to buy a 3D printer for their office much less for their home. 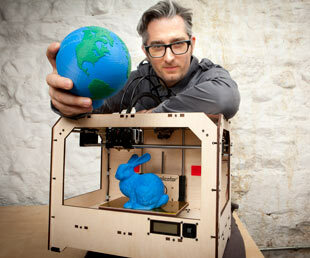 Makerbot changed the game by changing people’s mindsets and kicked off an industry. People are printing toys, cups, bowls parts and even guns (which are now outlawed) at home with a home 3D Printer. The International CES is the largest technology expo and trade show in the western hemisphere. Every year there seems to be some big theme surrounded by some new thing. For a few years it was smartphones, then apps, then startups, then wearable tech, now it’s 3D Printing. Several companies that support the 3D printing industry and make 3D printers will be exhibiting at CES in January. This year, Mr. Makerbot himself, Bre Pettis will keynote the 2014 CES Leaders in Technology Dinner. The Leaders in Technology Program at CES allows high-level public policymakers and technologists to learn from more than 3,200 exhibitors and thousands of new products that contribute to a dynamic industry that supports an expected $1 trillion in retail sales worldwide. The program also provides information and insight to assist officials in evaluating federal policies that affect the consumer technology industry.